Continuing Spread The Glove's Featured Artist section is East Lansing's own Desmond Jones. 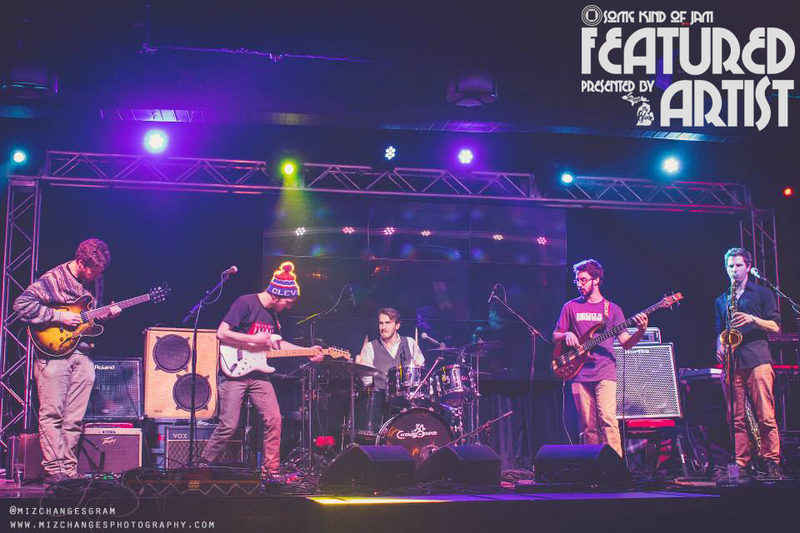 This five-piece funk/rock/jazz fusion group formed in 2012 and has played all over Michigan, Wisconsin, and Chicago with some of the Midwest's finest. With unique and original compositions, Desmond Jones blends melodic guitar riffs with an electrifying saxophone, groovy bass lines, and funky drums in order to create an upbeat and high energy live show. Before all that, guitarist Chris Bota was kind enough to sit down to some questioning, and like a true Michigander brought up Faygo, well-fated casino trips, and... ICP? Grand Rapids. Two of our members, John and Isaac, were born and raised in East Grand Rapids and we all plan to relocate to the city after this summer! Faygo and ICP (The Insane Clown Posse)! We try to make the “Gathering of the Juggalos” every year. Woooop Woooooooooop FAMILY! Michigan is such a great place for music that we can’t just pick one favorite venue! One of them is the Intersection in Grand Rapids. It is large enough to hold a huge crowd but small enough to still give you an intimate experience with the crowd. Another one of our favorite venues is the Loft in Lansing, MI. With Lansing being our hometown, it is always great to play to a crowd of friends, family, and fans that have become friends over the years! There are too many to choose from… but if we had to name a few we would choose Greensky Bluegrass, Vulfpeck, and Fried Egg Nebula! Number of times you've used your hand as a map? Is this a serious question for a Michigander?! The Great Lakes man!! Northern Michigan. What is better than a beautiful wooded landscape surrounded by tons of inland lakes?! Top 3 bands on your iPod? This answer also changes about once a week for me but if I had to choose right now I would say Apostrophe by Frank Zappa. Jam. Jelly comes up as a close second. Second favorite instrument to play? If you weren't playing in your current band, is there another band that you would love to play in? I would be completely devastated if I wasn’t playing with Desmond Jones but I also wouldn’t be too bummed about playing with Snarky Puppy either. There is absolutely no way I can name just one so I am going to provide you with four. Trey Anastasio, Frank Zappa, Thelonius Monk, and Charles Mingus. In your career, what has been the best on stage moment for you? The first time I noticed someone singing one of our songs, Rhyadah, word for word in the crowd. At the time I had no idea who this person was and was extremely honored to know that someone had spent that much time with our music to get to know it so well. Most embarrassing moment on the stage? I can’t say that I have ever felt embarrassed on stage. There was one time I zoned out quite a bit during a guitar solo and drooled onstage. I don’t know if anyone saw me do that though! Best part of being on the road? Spending time with my best friends and experiencing new places together! It has also been amazing starting to see some familiar faces along with new Jonesies from show to show. Our Lansing fans have been incredibly supportive and they make it that much more fun for us each night. Worst part of being on the road? The smells my car has accumulated from traveling with 5 musicians. The lack of sleep is also not the easiest thing to handle. Have you been to the Mystery Spot in St. Ignace? Bandmate with the best fashion sense? John Nowak is the best dressed and best groomed bandmate on the face of this earth. He will even groom the rest of us from time to time making sure our beards are in check and our makeup is on point. Bandmate with the worst fashion sense? To be honest, probably me. My goal most of the time is too look as wacky and weird as possible, usually with the help of shiny gold pants. Best city to play in? Mt. Pleasant, MI is amazing! We have just recently started working with an amazing group out of Mt. Pleasant that is called the Tree Love Collective. The guys that run this collective of artists and musicians are amazing people and we have gained some of the best fans we have through playing Tree Love events. Worst city to play in? We love playing in every city we travel too. We have taken away something from every show we have played and have never had an experience in a city that has negatively impacted us. What do you do to unwind after a gig? Something that is becoming sort of a ritual is listening to the set we just played right after the show ends and all our gear is packed up. It really depends on what city we are in but if we end up back in Lansing after a show that is what we will usually do, along with some nice tea prepared by JL Smooth (John Loria, Bass). One of our favorite things to do after a gig is to go to the casino and blow all of our show earnings! We have only done this twice, and have actually never lost any money overall!